The Victorian Government, through Water for Victoria, the Yarra Action Plan, the Plan Melbourne Implementation Plan and the Port Phillip Bay Environmental Management Plan, has committed to improving stormwater management for greener environments and healthier waterways and bays. Many stormwater policies involve changes to Victoria’s planning controls. Therefore the Minister for Planning, the Honourable Richard Wynne MP, has established an advisory committee to provide advice to the Minister for Planning and the Minister for Water, The Honourable Lisa Neville, on planning and development controls for improving stormwater management and strengthening the links between water management and urban planning. The Committee has been tasked with providing advice on which types of development, of those currently not subject to the state’s urban runoff management objectives, should be required to manage their stormwater impacts. The Committee has also been tasked with providing future policy directions aimed at improving stormwater management and strengthening the links between urban water management and the planning and development system more broadly. The Department of Environment, Land, Water and Planning (DELWP) is now inviting input from interested stakeholders to assist the Improving Stormwater Advisory Committee in its deliberations on the stormwater issues currently affecting our state. An Issues Paper has been released for review and comment. 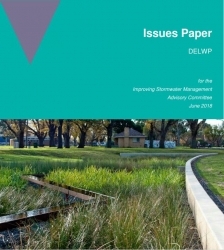 This paper, prepared by DELWP, summarises the key stormwater management issues and opportunities relevant to the Victorian planning and development system. It is designed to provide a starting point for discussion and to seek feedback. Closing soon: You can make a submission and download the Issues Paper by logging onto the Engage Victoria website. Please submit a response to the matters raised in the Issues Paper by 29 June 2018. If you have any queries, please email stormwater@delwp.vic.gov.au or call 03 9637 9404.